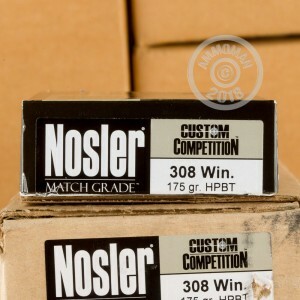 Nosler Custom Competition is designed to meet the needs of competitive shooters. This match grade .308 Winchester ammo comes in boxes of 20 and fires a heavy 175 grain boat tailed hollow point bullet at a muzzle velocity of 2,500 feet per second. 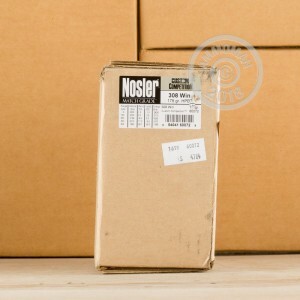 Nosler match grade ammunition is made in Bend, Oregon using non-corrosive Boxer primers and brass cases. Only the best components are used along with rigorous quality control checks. 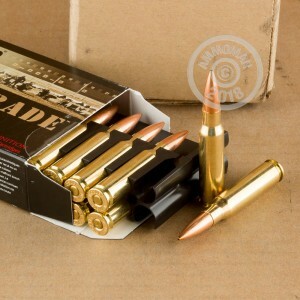 This results in top quality match ammo that more than justifies its price!